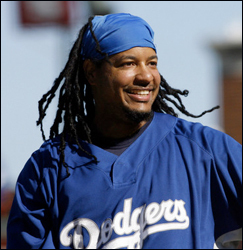 Manny Ramirez didn't retire from baseball so much as he quit, walked away, took a wrong turn into the Commissioner's office and was jumped, shackled and tossed from the game for the use of illegal drugs; performance enhancing drugs. He was credited with doing for a ballplayer what the slap of a walking stick does for the partially disabled med student, Donald Blake, in the legendary Marvel Comic Series, Thor. Like a can of spinach in the hands of Popeye, players like Barry Bonds and Mark McGuire smashed baseball records with the ease of Clark Kent bending steel. Talent has little to do with the accomplishments of these players. Baseball never juiced a baseball. It was just the batter juicing the game. Manny was just a punk from Washington Heights in New York City, where he hung around George Washington High School until he was 19. He was the New York City Public School Player of the Year all the way back in 1991 and a three time All City Selection hitting as high as .615 with 14 homeruns for a well earned place in New York City's Public School Athleteic Hall of Fame, probably the only Hall of Fame Manny will ever grace, but Manny being Manny probably doesn't care. He's already in a Hall of Fame somewhere and that is all that matters. Eventually, Manny was forced to quit High School baseball, probably taking a wrong turn out of a principle's office without ever graduating. Drugs, sadly, are as American as apple pie and performance enhancing drugs (PEDs) can be traced as far back as 1969, which may or may not account for the Miracle of the Mets. On June 12th, 1970 Doc Ellis took a hill with his hit of LSD and fired off a no-hitter for the Los Angeles Dodgers, an acid induced baseball sending one Padre after the other back to the dugout, shaking their heads in awe. The '86 Mets were so deep in 'snow' they might have worn rubber boots over their cleats while waltzing from the clubhouse to the dugout. Did cocaine make Keith Hernandez the great player he was, or was Keith Hernandez merely a great player with a sad love of powder? Alcohol and opium were the choice of America back in the day when greats like Babe Ruth were saving the game, creating the records by which all future ballplayers would strive. Lenny Dykstra could serve as the poster boy for PEDs. The skinny outfielder from the New York Mets literally turned into the Hulk as a Philadelphia Phillie. Compare his career numbers to that of Barry Bonds. Did Dykstra save a few bucks on the generic stuff, or, was Bonds simply a far greater talent? Has anyone seen the movie, Reefer Madness, a government produced educational film on the insanity caused by marijuana? In better times, the Government might issue a free copy with every prescriptions going out in California for pot because laughter, after all, is really the best medicine in the world and the cast of SNL could not have dreamed up a funnier movie. Manny brought plenty of laughter to game. He was baseball's gloved one, a child refusing to cross the line into adulthood. He graced the diamond with a charm and personality no other player can boast. Even when you hated Manny, you couldn't help but love him, ache for him to end up in your team's uniform. I overheard a former assistant trainer for a West Coast Major League team comment on PED's. He believes, in some 15 to 20 years, "PEDs will be a legally, prescribed treatment for players in all of sports." Sort of like pot, a substance smoked without the devastating effects of say, a Marlboro. Maybe then they'll remove all the asterisks. Of course it won't matter to Manny who will probably be knocking them out of the yard, in some Senior Citizens League. For now, however, Manny is being Manny no more.